Two Ultra Clear Screen Protectors that are robust, incredibly clear, easy to use and protect the screen and the console. 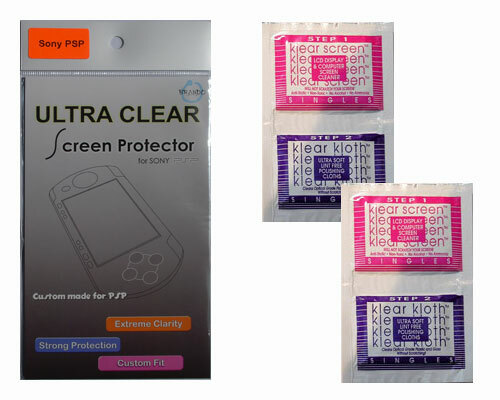 These robust screen protectors will prevent scratches and protect your Sony Playstation Portable screen and console whilst maintaining good quality image. It is clear & transparent. These screen protectors are customised to fit your Sony Playstation Portable Screen & console perfectly - no adjustments needed. It will improve the life of your valuable screen & console. 2 Sony Playstation Portable Ultra Clear Screen protectors. One protector for the screen only and one for the whole console.Use either one.